For openers, create a system-repair disc. Then get rid of the bloat by removing all that preinstalled junkware. Now let's talk security. As any regular PC World reader knows, computers and their users are vulnerable to all manner of threats, from hackers to phishing to viruses. That's why it's critical that you batten down your new machine's hatches right from the get-go. Psst! Guess what? Right out of the box, Windows 7 is already pretty darn secure. Its firewall and built-in anti-malware tool (Windows Defender) offer robust protection from everyday threats. Meanwhile, the latest versions of Firefox (3.5) and Internet Explorer (8) help keep you safe from pop-ups, phishing attempts, browser hijacking, and the like. As for e-mail, both Gmail and Yahoo employ Norton anti-virus software at the server level (meaning there's nothing you have to install), along with anti-spam and anti-phishing tools. If you happen to use either one, well, you've got clean mail. There are a couple tools of your own to consider adding to the mix. The first is a router, which has a built-in firewall that effectively renders your PC(s) invisible to the Internet at large--so no hackers will be able to break in. 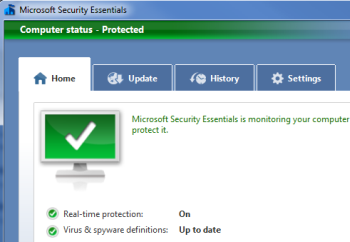 Second, for that little bit of extra protection, install Microsoft's widely acclaimed Security Essentials antivirus software. I also highly recommend Web of Trust, a free browser plug-in that shows you if Web links are safe--before you click them. How about you? Are you comfortable leaving your security primarily in Microsoft's hands, or do you feel safer with, say, a McAfee or Norton suite doing its thing?